PAULINE Hanson lashed out at the government and her fellow crossbenchers in a blistering rant on Channel 9's Today show this morning. The One Nation leader defended her use of the phrase "It's OK to be white" in a controversial Senate motion denouncing "anti-white racism" and "attacks on Western civilisation". The motion was narrowly defeated 31-28 on Monday, with the government supporting it. Under intense political pressure yesterday, the Coalition said an "administrative process failure" had led it to vote the wrong way by mistake. But the reversal came too late to stem an avalanche of criticism, with the government's political opponents accusing it of endorsing "the words used by white supremacists and neo-Nazis". "It's OK to be white" is a favourite catchphrase of far-right trolls that was first dreamt up on 4chan. Both the government and Ms Hanson say they were not aware of those links. Ms Hanson responded to the outrage during an interview with Today host Karl Stefanovic today. "Nice to see your smiling face this morning. Plenty of journalists were drawing parallels between your words and white supremacist and neo-Nazi movements in the US. Just setting the record straight this morning, are you a white supremacist?" Stefanovic asked. "Definitely not. I think it's so funny. It's absolutely ridiculous to connect me with that, and that's what they want to do, all this PC brigade out there, they want to connect me with that. What a load of hogwash. Rubbish," Ms Hanson said. "What do you think of those who voted for your motion and then, shockingly, took it back?" Stefanovic asked. "They're absolute fools. They really are. The way the Liberal Party and National Party have acted over this is ridiculous. They should have let it go. They should not have said anything about it, and there wouldn't have been a problem with it," she responded. But the One Nation leader reserved particular venom for her colleagues on the Senate's crossbench. "They were spooked by the Labor Party and the PCs and the Greens. You should have seen (Greens leader Richard) Di Natale, he was frothing at the mouth. The spittle was coming out. There was so much hatred. "And the stupid fool Derryn Hinch, when he got up and said - he only gets up and says anything or wants to be anywhere beside me just for the headlines, just to get publicity. It's absolutely ridiculous what has gone on in this parliament." 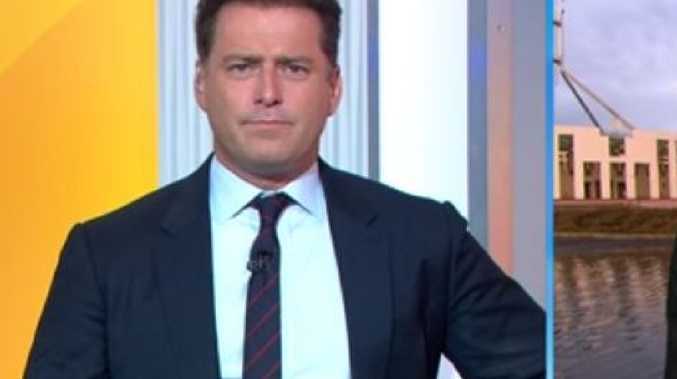 Instead of grilling Ms Hanson, Stefanovic turned his attention to the government, calling its response to the controversy "woeful". "Let's not sugar coat this. The only thing worse than the vote was the excuse, it was seriously pathetic," he said. "It was pathetic. Absolutely pathetic," Ms Hanson agreed. "Let's take it word for word. What I said is that the deplorable rise of racism towards the whites, white society, plus also protecting Western civilisation, and it's OK to be white. If I'd got up and said, on the floor of parliament, it's OK to be black, there wouldn't have been one word about it. "As I've said all along, I believe everyone should be treated equally, and I will go back to 22, 23 years ago I was saying that. "People out there are pushing this feeling pity, sorry for what the whites have done to people in this nation. I think it's disgusting. And I think that we're all Australians together. And I'm fed up with it and so is the majority of Australians." "I guess the problem is that you saying that and you debating it is more divisive than inclusive," Stefanovic said. "If we don't say anything then they are suppressing us and our views and our thoughts. It's like climate change. If you say anything about climate change or are anti their agenda, you are held down and criticised," Ms Hanson replied. "Political correctness in this country is ridiculous. People have a right to have an opinion and have a say. That's what our society, our democracy and our Western civilisation gives us. If we don't speak up against this they will actually suppress us. I won't let it happen." Stefanovic suggested the government was too focused on social issues instead of the economy. "They're terrified, they're trying to keep up with the Greens and Labor," Ms Hanson said. "They're terrified of you," he interjected. "Well good. I hope they are, and they should be, because I'm trying to represent the conservative values, people who have been forgotten," she said. 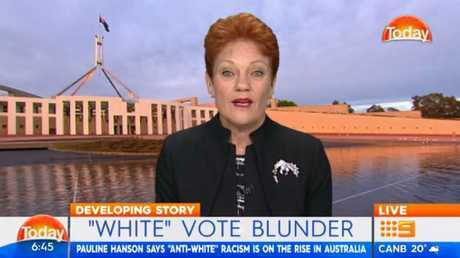 Ms Hanson's vociferous denials of any racist intent have done little to sate Labor and the Greens, who ridiculed the idea the "It's OK to be white" slogan had been misinterpreted yesterday. "There is nothing innocent, nothing unknown, nothing hidden about this phrase. 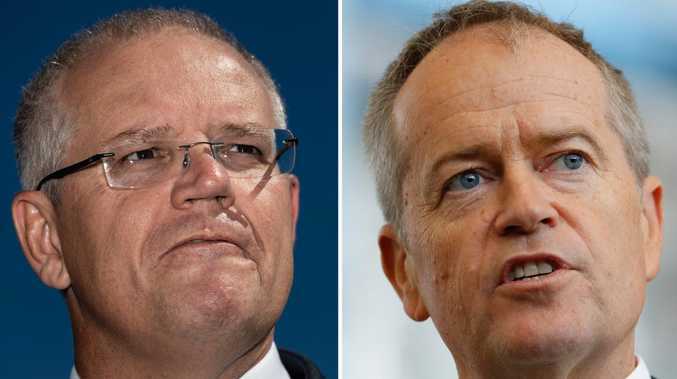 Frankly, the claim that somehow the government didn't understand it or didn't know about it is not believable," Labor Senator Penny Wong said. "We are supposed to believe that no one in the government paid attention and some junior staffer ticked it off, and then government senators just filed in and sat behind Senator Hanson oblivious to the fact that they were endorsing a racist motion designed to promote Nazis, the Klan and other white supremacist groups." "It's OK to be white" started on 4chan's "politically incorrect" image board, which is a sort of gathering place for anonymous trolls. It's a diverse group, in its own weird and often disturbing way. There are white nationalists, men's rights agitators, some of Donald Trump's more demented fans, people who just really hate political correctness and some straight up racists and misogynists. The original post in the forum called for people to put up posters bearing the phrase on university campuses, in the expectation the media would go "completely berserk". "Normies tune in to see what's going on, see the posters saying 'It's OK to be white,' and the media and leftists frothing at the mouth," the "game plan" read. "Normies realise that lefties and journos hate white people, so they turn on them. Credibility of far left campuses and media gets nuked, massive victory for the right in the culture war, many more /ourguys/ spawned overnight." Australia was properly introduced to the "It's OK to be white" slogan when Canadian alt-right activist Lauren Southern visited the country for a speaking tour in July. Ms Southern donned a T-shirt bearing the catchphrase as she touched down in Brisbane.